Meander Bag by Kathy Schradle. Kathy make these small bags for runners, bikers and anybody who likes to walk the beach or trails and pick up shells and rocks. They are made from high density Pac-Cloth on the back and a cotton/poly fabric on the front. They are water resistant and and very durable. Also colorful and fun! This one has a nylon loop to hang the bag from a belt or hook. 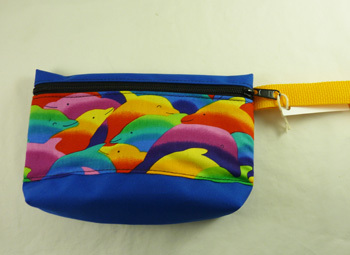 It is a pouch shape, 9" x 7" with heavy duty zipper.